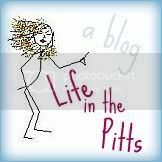 Life in the Pitts: How's your love tank NOW?? You're too cute. My husband's love tank only fills from one activity. It doesn't involve cleaning the house! OK - I seriously need to start having better conversations with my husband... or maybe I just need to be better at remembering them - because your conversations seem WAY more interesting than ours! gosh, dear, that's hilarious:) and cute. Ice cream should bring him up a full point! Haha. Nice. "You know it doesn't work that way." That's something I would hear, but not in regards to cleaning, in regards to getting ready for the day. I call it a good day if I never leave my pajamas. He calls it a good day if my hair is done, I'm wearing makeup, and I am not wearing a tshirt or sweatshirt. This made me laugh. And I could echo the first poster. I so so so love that book and think the advice there is something every couple should read and internalize.